We offer a wide range of classes at different times during the week, for afternoons and evenings. In our studio we have nearly a thousand photos of students with their completed projects; We have posted some of them online in our Student Projects Gallery to show the range of projects students can undertake. The copper foil method is recommended for beginners to get the basics of working in stained glass under their belts: Cutting, grinding, foiling, and soldering. The copper foil, or often-called Tiffany-method, is used primarily for smaller objects and 3-dimensional pieces. Limit is 5 students per class. Cost is $125 plus $20 supply fee. Additional cost for glass selected. $50 deposit is required at time of sign-up. The lead came method is more advanced and used primarily for larger windows like those installed in homes and larger public areas. We cover the sizing of the project, leading, waterproofing, and installation basics. Copper foil experience recommended. Cost is $125, $20 supply fee. Must pay for glass and lead came. Come join guest artist Debra Mager from Cinderella Mosaics and learn a magical, beautiful mosaic technique, developed by the late, legendary mosaicist, Laurel Skye. Debra was taught by Laurel several years ago, and now shares this magical technique with others, with Laurel’s blessings. You will create mirrors that resemble tapestry, using materials such as stained glass, beads, jewelry, trinkets, and other treasures. Once you learn this method, you can use it to cover other things, too, like boxes or vases, etc. Since no grouting is involved (yay! ), you can embed just about anything. Some mosaic experience is a plus but not required. 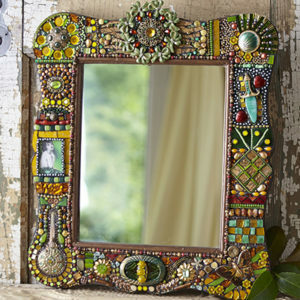 We will meet from 10 am – 4 pm both days, and you will take home your original jeweled mosaic mirror at the end of the day Sunday. The cost of this one-of-a-kind experience is $300.00, which includes supplies and materials. Please inquire for more information on fusing and slumping classes. This class focuses primarily on designing. There are basics to keep in mind, cuts that cannot be made, stress points in the glass and the final look of the panel. Choosing from a bin of arbitrary bevels, the student has to draw the design, then choose background. It's fun to learn just what your limitations can be with glass and what you can do. Class is 6 weeks. Limit is 6 students per class. Cost is $125, plus $20 supplies fee. Other glass costs based on glass selected. $50 deposit is required at time of sign up. Call for details and to set appointments.